Works with all Keurig K-cup brewers including the 1.0 & 2.0 brewers. Twice the variety of other sampler packs! Experience 40 unique coffees from top, hard to find, awesome brands without committing to a whole boxes of each. Not everyone likes the same coffee - our sampler packs are a fun way to find your favorites and have something for every taste. Particularly useful for serving guests, in an office setting, and even as a holiday gift. Brands include: Wolfgang Puck, Cake Boss, Marley Coffee, Skinny Girl, Martinson, Guy Fieri, Crazy Cups, Double Donut, Barnies Coffee Kitchen and many more. 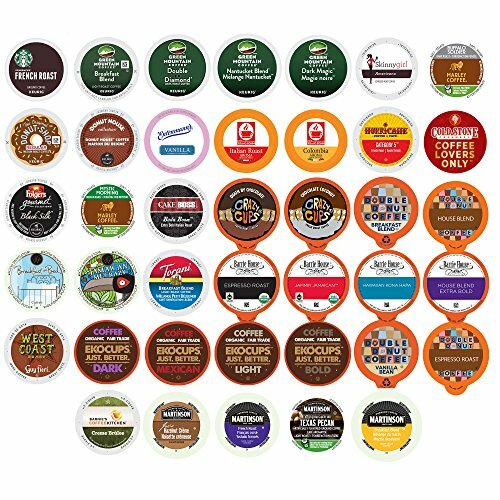 Capsules are repackaged and not in original packaging, items may appear in different packaging then portrayed in the image and in a different variety of flavors; K Cups, Green MountainⓇ and Keurig are registered trademarks of Green Mountain and/or Keurig and we have no affiliation with Green Mountain and/or Keurig. If you have any questions about this product by Custom Variety Pack, contact us by completing and submitting the form below. If you are looking for a specif part number, please include it with your message.